When I ask my children what they enjoyed the most about a trip, my daughter very often remembers the food. She is my adventurous child who is willing to try new things and enjoys the atmosphere in local restaurants. When we heard about Guanabanas in Jupiter, Florida, we were hooked on the name alone, but we had no idea what a hidden treasure it really was. The restaurant offers valet parking since the free parking lot is a couple of blocks down the road, but we chose to park ourselves and enjoy the beautiful weather. Once we were seated, we felt like we were in the middle of a tropical paradise and even got to enjoy a live band playing while we ate. First off, I will say that our meal was fully comped by the local tourism board, but I would gladly visit again and pay … and I intend to do just that the next time we are in the area. That’s fairly easy to say, since the prices are fabulous, but the food is also incredibly good. We were looking for something light and I wanted seafood, because … Florida! The Daily Specials menu had just what I was looking for. My daughter and I love Queso and the boys like the chips, so we started with some Queso Dip. It was savoury, warm and delicious, without being too spicy. If the boys would have tried it, I think they would have liked it as well, but they stuck to the chips. They played it safe with their meals too and ordered hot dogs from the kid’s menu. Avery and I decided on chicken tacos for her and Baja Fish tacos for me. My tacos had mango in them and they may be the best fish tacos I have ever eaten. The mango combined with the fish gave it such a fresh flavour, and the avocado aioli on top was also to die for. After removing the pickled onion from her chicken tacos, Avery was very pleased with them as well. I try to go easy on the sweets but really did want to try the key lime pie, so I ordered one slice for the table. It was more tangy than sweet, had a smooth graham cracker crust and meringue, set on top of powdered sugar. 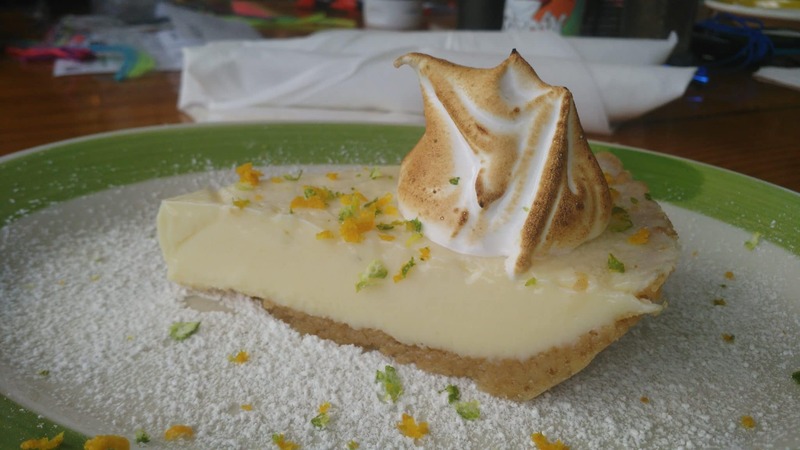 I am partial to the sweeter key lime pies, but still enjoyed this one. I learned that Kellen prefers tangy because he devoured half the pie himself. Guanabanas has hit my “must visit” list for the Eastern coast of Florida, and you will want it on your list too. Make reservations before you go because it is a busy place with a long line of customers hoping to get inside.